VIPER SOFT is a new development with even softer pimples. The rubber produces a low bouncing, wobbly ball both while blocking passively and for chop-blocking. The new rubber formula also allows for more backspin while chopping from behind the table. Furthermore we managed to keep the outstanding attacking possibilities of VIPER for this new version, thus creating a long pimple rubber that excels in a variety of fields. VIPER SOFT: Give it a try! 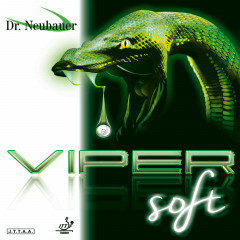 Dr. Neubauer Rubber Viper Soft is beeing added to cart.